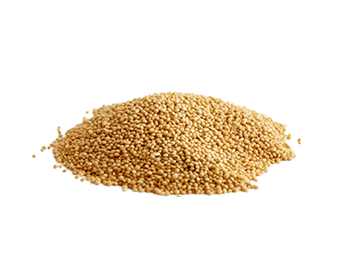 Amaranth (Amaranthus caudatus L.) is a pseudo-grain like quinoa, native to South America and grown for its edible starchy seeds. A staple food of the Aztecs and an integral part of Aztec religious ceremonies, Amaranth is high in protein and lysine, an amino acid found in low quantities in grains. It is a moderate-rich source of the dietary minerals phosphorous, manganese and iron which help promote healthy bones and muscles. The vitamins A, C, E, K, B5, B6, folate, niacin, and riboflavin, which act as antioxidants, are also found in Amaranth. When compared to wheat, Amaranth contains a higher and better quality of protein and higher concentrations of folic acid, fiber and minerals. Also present are phytochemicals including polyphenols, saponins, tannins and oxalates. The oils and phytosterols in Amaranth help maintain healthy cholesterol levels.